Poured 20mpa concrete basement walls with heavy duty damp proofing & weeping tiles. Drain clad fiber board on foundation walls to enhance overall water resistance and foundation protection. R23 exterior walls - 2” x 4” S.P.F. stud on 16” centers are with 1 ½” (R9) insulated sheathing. Flat ceilings insulated to R50. Vaulted/sloped ceilings (where applicable per plan) are insulated to R54. Floor joist are 2" x 10" with bridging, 5/8” tongue & groove spruce plywood for subfloor, glued and reinforced with screws to resists squeaks. Engineered roof trusses with ½” plywood sheathing. Built up wood & steel beam construction on steel posts. Self-sealing high grade architectural profile Owens Corning Oakridge asphalt shingles with manufacturer’s limited lifetime and wind resistance warranty up to 177 km/hr. Poured 32mpa concrete porches and garage floors. Resilient channel on truss ceiling. Underground serviced subdivision (hydro, cable telephone, and natural gas) including paved roads, curbs, storm, sanitary sewer, and water connections. Genuine clay brick main floor exterior. 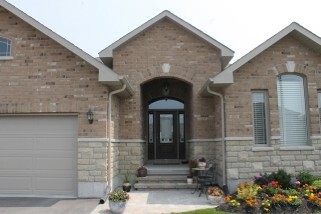 Non-brick areas maintenance-free siding or stucco. Maintenance-free aluminum soffit, fascia, eaves trough and downspouts. Fully sodded lot including boulevard. Interlocking walkway to front entry. Two (2) exterior frost-free hose bibs. In-Ground lawn irrigation system for easy care. Comes with a programmable control panel to reduce water costs. Two (2) exterior waterproof electrical outlets. All exterior colour schemes are architecturally controlled by vendor. 120 square foot pressure treated wood deck with stairs to yard as per plan. Front yard landscaping shrub package. Driveway to be completed with crushed stone gravel. Maintenance free, prefinished steel, wood grain embossed sectional insulated overhead door(s) with galvanized steel components. One automatic garage door opener, ½ hp with belt drive for a smooth and quiet operation, comes with 2 remotes and a keyless entry pad. High performance EnergyStar windows and sliding glass patio door(s) or French door (where applicable) with Energy Ratings up to 35. Maintenance free, vinyl clad, dual-pane low-E insulating glass with argon gas for insulating value to provide long-lasting thermal performance. Coloured (earth tones) casement vinyl windows with grills on the front of the house, white vinyl on remaining sides and rear of the house as per plan and specifications. All operating windows to have screens. Insulated fiberglass entry door and door from garage into home to resists dents and dings from day-to-day use. Fashionable designer glass insert on front entry door and sidelites (where applicable) from builders samples. Safe Lock Weiser security dead bolt with matching lever handle with all locks keyed the same. Upgraded EnergyStar KeepRite 96% High Efficiency gas fired forced air furnace with 2 Stage ECM blower, and an easy to use programmable thermostat. Supply ductwork is sealed with Pro-Seal premium grade painted duct sealant, with no peel off. Life breath High efficiency EnergyStar Heat Recovery Ventilation system (HRV) to ensure the benefits of superior indoor air quality. It's installed with independent duct work provided to the bathrooms and kitchen with an electronic (quiet) timer control button. The main panel is a digitally controlled centrally located in the home. Natural gas EnergyStar rental hot water heater supplied by EnerCare (formerly Direct Energy). Sump pump is connected to the exterior. 200 amp. Service with circuit breakers, and copper wiring throughout, as per Ontario Hydro standards. Smoke detector with strobe light in each bedroom. Carbon monoxide detector with strobe light on each floor. Front entry door chime with lighted LED button. White décor light switches and standard white plugs. Four outlets in the full unfinished basement in addition to the mechanical room outlets. unfinished basement areas and garage receive a keyless light socket (fixture). 9’ main floor ceilings (pending home layouts). JELD-WEN interior doors (from Builders samples). Colonial window trim of 2 ¾" and 5 ¼" baseboard. Interior door handles are available in knob or lever type, satin nickel, antique nickel, oil rubbed bronze or black. Rounded drywall corners and baseboard corners in finished areas of home. Smooth painted ceilings throughout the home. Staircase as per plan with wood hand rail (where applicable) with a choice of metal spindles from builder’s samples. Modern wire shelving in all closets. Rough-in for future Central Vacuum System, in the finished areas of the home. Rough-in five (5) cable television outlets/jacks and five (5) telephone outlets/jacks. Basement exterior walls strapped with 2x4’s, insulated to R12 and covered with 6 mil polyethylene. Choice of custom designer quality kitchen cabinets. 5” crown molding with the kitchen upper cabinets. Soft close drawers & doors. American Standard pulldown single lever, ceramic valve, washerless faucet with incorporated sprayer. Sink has lever water shut-offs under the sink. Granite counter tops in the kitchen from builders samples. Double stainless steel bowl kitchen undermount sink. Rough-in for dishwasher and over-the-range microwave oven. Heavy duty plug receptacle for stove installation. Choice of custom designer quality vanity cabinets. Laminate countertops from builder’s samples. Ensuite to have porcelain/ceramic tile shower with custom glass door, slide bar shower head and a pressure-balanced valve. 1 piece Acrylic tub unit with pressure-balanced valve in main bath. High quality American Standard white plumbing fixtures in all bathrooms. Sinks has lever water shut-offs under the sink. Toilets are water saving 4.8L flush and a lined tank. American Standard single lever, ceramic valve, washerless faucets in all bathrooms. Mirrors above vanities or each sink (where applicable). Basement rough-in drains and vents for future 3 piece bathroom. Heavy duty receptacle plug for dryer hook-ups. 4” dryer vent ducted to the exterior. Washer has water shut-offs at counter height. All doors and woodwork trim are spray applied with Sherwin & Williams ProMar® 200 Zero VOC Interior Latex semi-gloss paint for ultimate long lasting finish. Scotchgard protected Berber carpet or Quality name brand 32 oz. Broadloom – 1 colour from builder’s samples. Prime bonded 10mm thick (7 pound density) carpet cushion to make your carpet feel luxurious. It reduces noise to make your home quieter, it insulates your floors to reduce energy costs, and no ozone-depleting CFCs. Choice of imported porcelain/ceramic floor tiles for: foyer, bathrooms, kitchen, and main floor laundry from builders samples. ¾” thick Hardwood with finished flush floor vents in living area on main floors of home from builder’s samples. 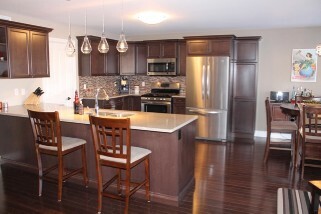 Supplied and installed by Gaylord’s Hardwood Flooring. Flooring has a 10-coat titanium finish for a durable, clear finish with a 40 year warranty. 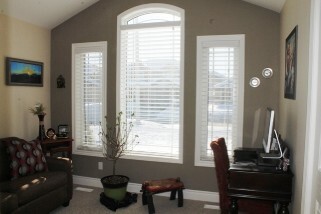 On site interior designer and colour coordinator to assist your needs. Exterior colour package – soffits, fascia, eavestroughs, brick and roof shingles. Tarion Warranty Corporation enrolment fee included. Walk-through inspection with the builder prior to closing. Home professionally cleaned prior to move in. Depending on site conditions, house may be mirror image. HST included based on eligibility and rebate assigned to the builder. The HIGHEST RATING for After Sales Service Excellence for 31 consecutive years.